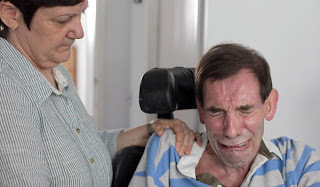 LONDON — A 58-year-old British man suffering from so-called locked-in syndrome died Wednesday, six days after a panel of High Court judges rejected his request for help in ending his life. His death is certain to galvanize the already contentious debate about assisted suicide in Britain. The man, Tony Nicklinson, (pictured) a former rugby player and sky diver who suffered a stroke in 2005, died at his home in Melksham, 80 miles west of London, at 10 a.m., according to a statement issued by the law firm that represented him. Mr. Nicklinson’s family used his Twitter account to say that he died of natural causes. At a news conference, Saimo Chahai, the family lawyer, said Mr. Nicklinson had been refusing food since the court ruling and had declined rapidly over the weekend after contracting pneumonia. “The fight seemed to go out of him,” she said. After having a stroke while on a business trip to Athens, Mr. Nicklinson, a civil engineer, developed locked-in syndrome, an incurable condition in which a patient loses all motor functions but remains awake and aware, with all cognitive abilities. He had spent the last seven years paralyzed from the neck down and unable to speak, feed himself or even clean his own teeth, communicating through a system that allowed him to write messages on a computer screen by blinking his eyes. He had argued in court that he would be physically unable to administer a lethal drug to himself, and that his only path to release from his “living nightmare” would be permission from the court to have somebody else — in his suggestion, a doctor — administer the necessary dose without fear of prosecution. Under British law, anybody, including a doctor, who knowingly helps a terminally ill person to die faces possible criminal prosecution and a lengthy jail term if convicted. “It is not for the court to decide whether the law about assisted dying should be changed and, if so, what safeguards should be put in place,” the ruling said. The government of Prime Minister David Cameron, as well as the British Medical Association, representing 140,000 doctors and medical students, applauded the ruling. Mr. Nicklinson’s anguished appeals to be allowed to seek assistance in ending his life culminated with a heart-wrenching scene, captured in a video posted on the BBC Web site, after the court decision last week. It showed him sitting at home in a striped sports shirt, sobbing heavily and groaning as he listened to a television report of the court ruling. His wife, Jane, standing at his shoulder, can be seen leaning over to wipe his mouth. In Europe, only Belgium, Luxembourg and the Netherlands allow euthanasia. Switzerland allows assisted suicide and is the only country that helps foreigners die, at a clinic near Zurich. The British law against assisted suicide was mitigated in 2010 with a statement by the Crown Prosecution Service, responsible for criminal cases, that set out the detailed circumstances that would be taken into account in reaching a decision on whether to press charges. Keir Starmer, director of the prosecution service, said at the time that it was for Parliament, not prosecutors, to change the law that made assisted suicide a crime. But strongly held views on the issue, which cross party lines in the House of Commons and involve uncompromising opposition from right-to-life groups, including the Roman Catholic Church, have kept governments from tackling the issue for decades.